Collaboration with celebrities has become a hallmark for the Concert Band. The band was featured with Arthur Godfrey of NBC radio fame in 1927. Gene Kelly was guest star for the first episode of “The Navy Hour” radio program in 1945, which the band produced for an astounding 23 years. More recently, the band featured guest artists Tony Curtis and Gregory Peck. In 2002, the band was filmed performing “America the Beautiful;” the performance was broadcast by the NFL prior to each game during opening week. 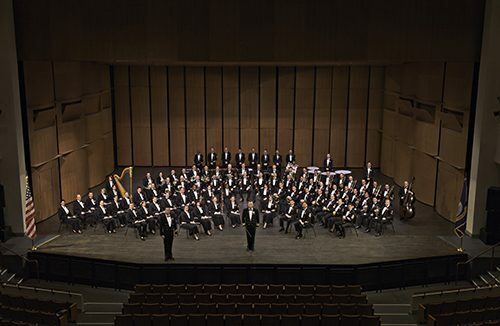 Recognized as one of the finest wind ensembles in the world, the Concert Band is in constant demand by the nation’s foremost musical education organizations, such as the American Bandmasters Association and The Midwest Clinic.